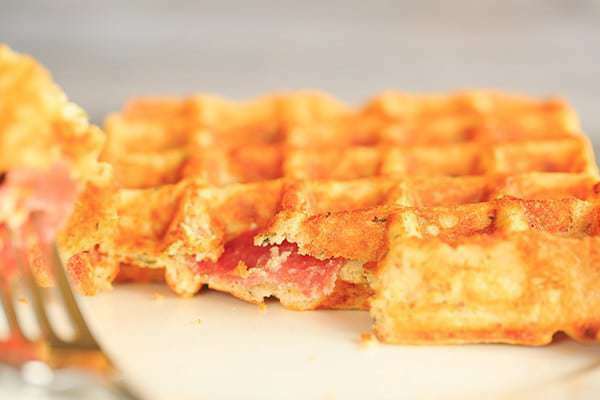 A few years ago around the holidays, I was at my in-law’s house when my brother-in-law busted out a recipe he had found for waffles made with salami and cheese. We were all intrigued, and in the blink of an eye, my father-in-law took out the waffle maker and the batter was in the works. You’d be hard-pressed to find a group of people who grew up with a pot of spaghetti sauce simmering away on the stove every Sunday to NOT like something with salami and Italian cheese, so it goes without saying that we were all huge fans. I somehow totally forgot about this recipe until a few weeks ago. When I texted my brother-in-law asking about it, he said he had seen it on a morning show featuring holiday recipes, and it was actually an adaptation of a recipe from Lady Gaga’s grandmother. 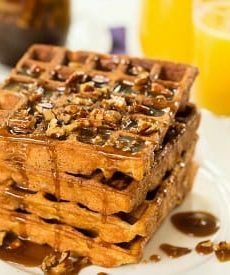 I’m a pretty typical butter and syrup person when it comes to waffles, but this savory version totally won me over. We’ve been eating these for breakfast, lunch and dinner the last couple of days, so suffice it to say – you aren’t stuck serving these for breakfast! 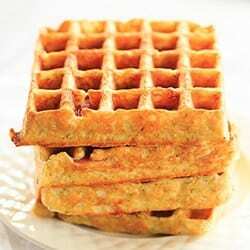 I think the cheese and herbs make the waffles, as they add a good bit of saltiness and flavor. 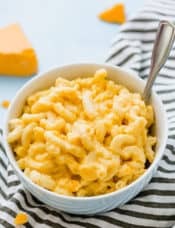 The recipe states that you can serve these with an extra sprinkle of cheese and fried chicken, which I think sounds amazing. 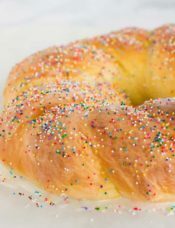 We ate these straight-up with nothing on them, but I’m sure they would be good with a little butter or a side of pizza sauce for dunking! 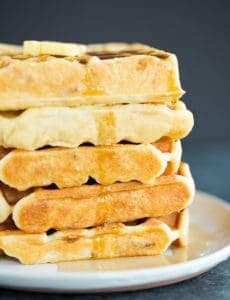 This recipe is an awesome starting point for all kinds of potential meat-and-cheese adaptations; if you’re looking for an alternative to traditional waffles, give these a try! 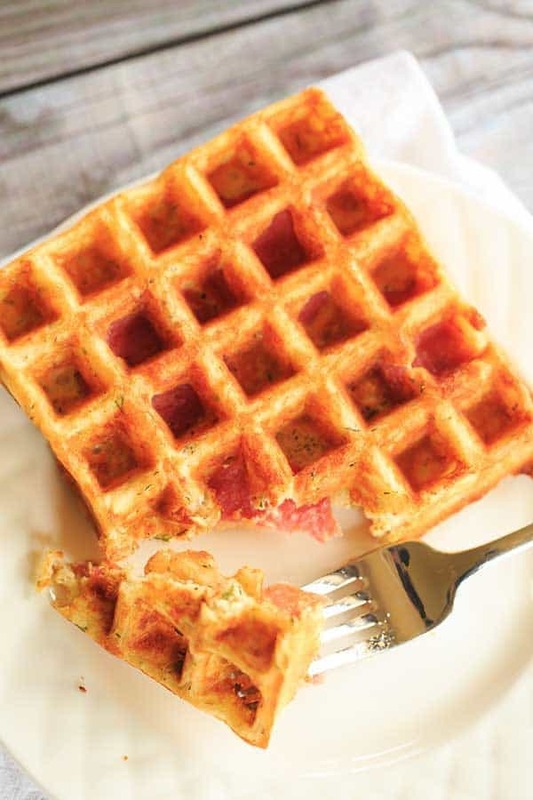 Savory waffles loaded with chopped salami, Italian cheese and herbs. 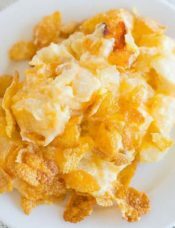 Great for breakfast or an easy dinner! Heat the olive oil in a large skillet over medium heat. Add the ½ cup salami and fry until crisp, then remove to a paper towel-lined plate to drain. Reserve the remaining oil in the pan. Coarsely chop the cooled salami and set aside. 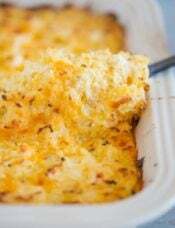 In a large bowl, whisk together the flour, cornmeal and baking powder. Stir in the parsley, rosemary, thyme and cheese. In a large measuring cup or small bowl, whisk together the milk, eggs and reserved olive oil. 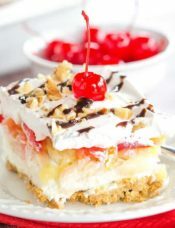 Pour the mixture into the dry ingredients and, using a rubber spatula, gently stir until completely combined. Stir in the chopped salami. 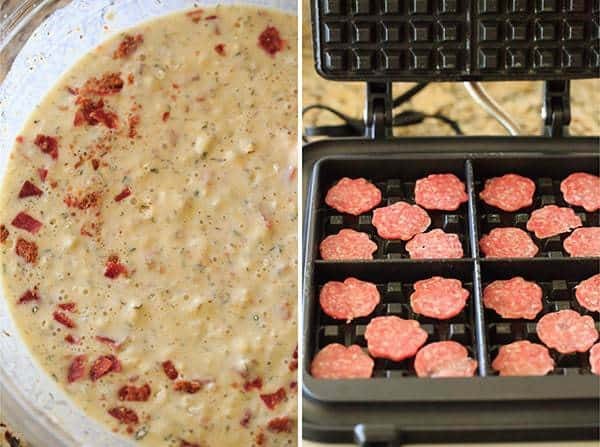 Preheat the waffle maker, then spray with non-stick cooking spray and place the sliced salami across the cooking grates. Pour the batter in and bake according to the manufacturer's instructions. Serve immediately. 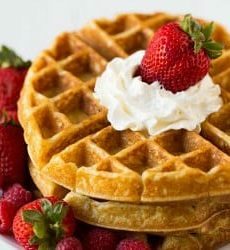 The waffles can be stored in an airtight container in the refrigerator for up to 4 days and reheated before eating. They can also be frozen for up to 2 months. Could you make a sandwich with these? Sounds worth a try! I am thinking that bacon would be great too. However what cheese and herbs would you recommend? Hi Beatrice, Green onions or chives would go great with bacon! 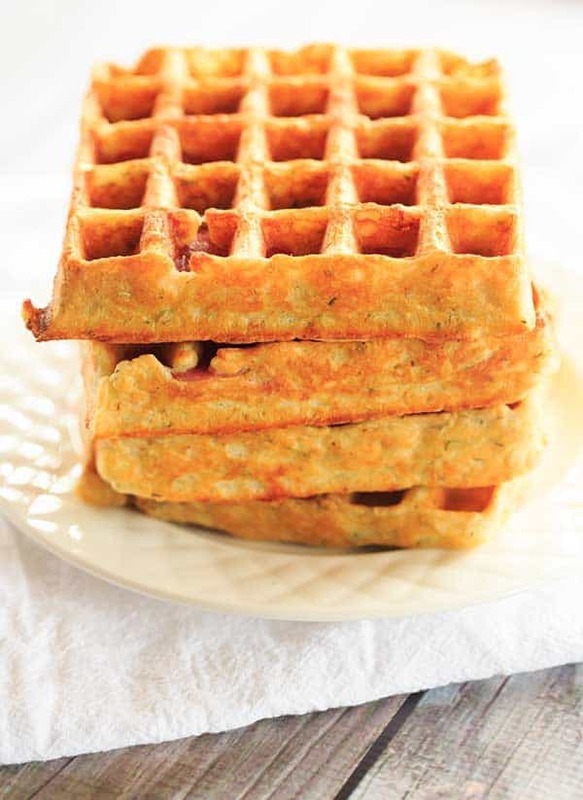 Waffles are a weekend treat in my family – but I rarely make up savoury ones! Thanks for the idea! Leave it to you – I’ve never heard of anything like these little yummy looking things! Can’t wait to try them! I am a savoury waffle convert, and these look amazing! 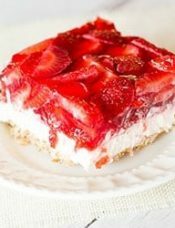 It reminds me of an Italian Easter Pie recipe…I would probably eat them straight up, without any syrup or anything…but the savory/sweet combo would be good too…maybe a syrup mixed with hot pepper jelly, to give it a little spice. Hi Michelle, Yes, I think marinara would totally work! I have not jumped aboard the savory waffle train or the chicken and waffles movement either. Sounds delicious so I need to get busy. I have a silly question though. Are these served with butter and syrup? Thanks for your help! I wondered the same thing. Maybe some marinara? Hi Marla, I updated the post above to include some serving suggestions, but no butter and syrup. We ate them straight, and the original recipe suggests fried chicken, but I think some pizza sauce for dunking would be good, too!